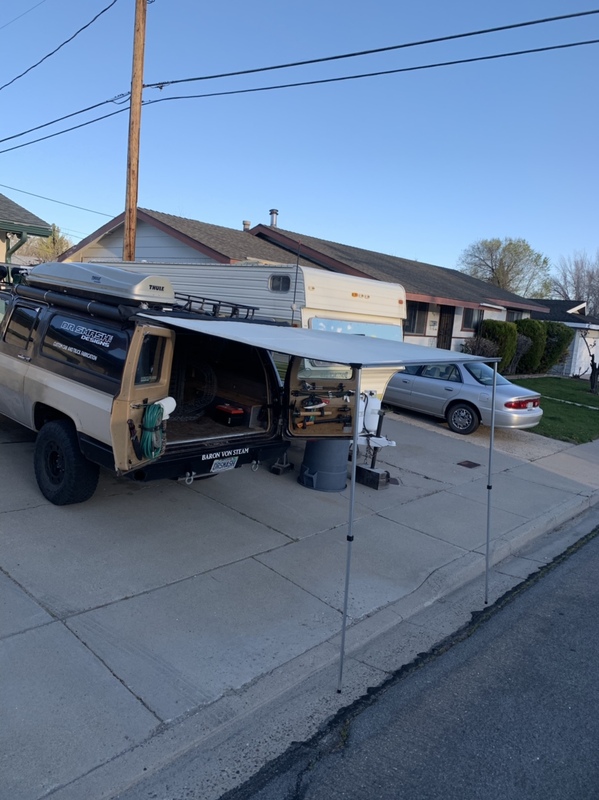 Little awning for the truck. It’s a 90” wide x98” long and I made double mounts so it can be mounted on the side or on the back. It travels on the side because of width. A little instant hot water heater for the shower. Made from a single burner camp stove, little file record box, 10 ft of 3/8 copper line and some specialty compression fittings. Garden hose hook up or to the solar shower with an RV shower head or any shower head for that matter. With the shower head and holder. Starting to get the inside pack situated. My goal is to keep the floor open for my 3 dogs to travel. So far I have 18 gallons of water storage and I’m considering a 18 gallon boat bladder in a box under the floor.